Eugenio Garza Pérez of Mexico enjoyed his first Longines FEI Jumping World Cup™ qualifier win this weekend at Split Rock outside Columbus, Ohio. Garza Pérez beat out nine other jumpers aboard his bay gelding Victer Finn Dh Z in an exciting jump off, riding clear in 41.33 seconds. Peter Lutz of the USA finished second at Columbus, also going clear in the jump off in 41.49 seconds. Third place went to American Kelli Cruciotti, who turned in another clear ride in 42.65 seconds. At the Longines FEI Jumping World Cup™ event in Sacramento on Saturday, Germany’s Wilhelm Genn was victorious. 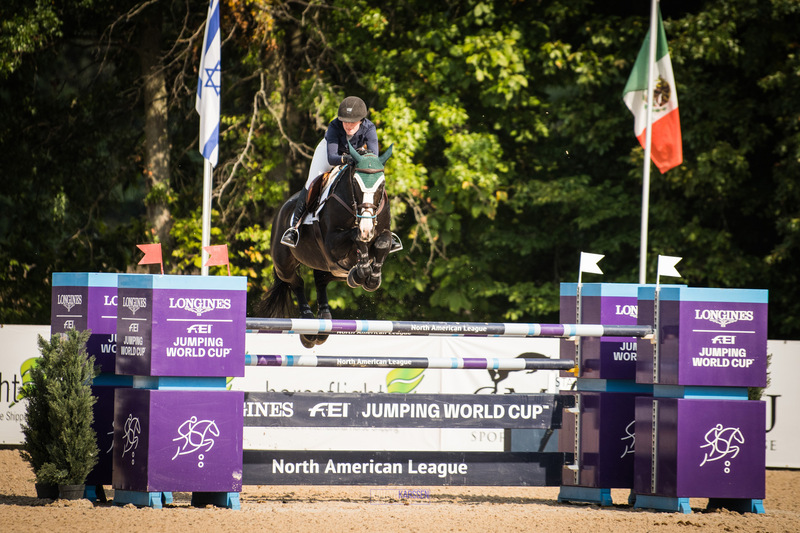 The Columbus event capped a fortnight of top-flight Jumping competition at Split Rock and featured defending Longines FEI Jumping World Cup™ champion Beezie Madden. It was the second of seven qualifying legs for the North American Eastern Sub-League to see who will advance to the Longines FEI Jumping World Cup™ Finals in Gothenburg, Sweden, next April. Ireland’s Alan Wade, who did such a fantastic job at the FEI World Equestrian Games™ last month in Tryon, designed the dynamic Columbus course. The allowed time of 78 seconds only caught two riders out, but the final line approaching the finish kept many riders out of the jump off. The entire course required elasticity in pacing and control, asking riders to go for broke one moment and pull their mounts back the next. Neither Madden nor the experienced Margie Goldstein-Engle were able to get the better of it, although the crowd were thrilled to see Madden’s stallion Breitling Ls in person, as the owner lives in the area. Ten of the 36 riders were up to clear rounds, however, and went on to jump an abbreviated version of Wade’s first course in under 54 seconds. American Charlie Jayne went first in the jump off and was clear at 49.75 seconds. Mattias Tromp of the USA, who finished third in New York last week, and countryman Andrew Welles both had rails down for 4 penalty points apiece. Eve Jobs of the USA had a beautiful clear ride at 45.44 seconds, which put her in the lead for the moment. But with six riders still to go, Jobs was left to bite her nails and wait to see if her time would hold as the fastest. Ireland’s Kevin Babington had a fence down, and was out of the running. But then Garza Pérez got a chance to show his stuff. Flying through the course, he stayed clear of faults and at 41.33 seconds, pulled into the lead. American Kelli Cruciotti posted another fast time at 42.65 seconds, moving into second place. Kristen Vanderveen of the USA, who won her first Longines FEI Jumping World Cup™ event last spring at Live Oak, gave it her best shot, but brought down a rail at the Lugano Diamonds vertical. Whilst she completed the course in lightning time, the 4 penalty points left her out of the top spots. American Molly Ashe Cawley, who took the American Gold Cup only seven days ago at Old Salem, tried to make it two in a row, but the Split Rock vertical was her nemesis, and she ended on 4 points. Peter Lutz of the USA was the last rider to go. He cut his lines as tight as possible, and with a clear ride at 41.49 seconds, moved into second place behind Garza Pérez and ahead of Cruciotti. In the end, Jobs took fourth place, followed by Jayne and Welles in fifth and sixth, respectively, with Vanderveen, Ashe Cawley, Babington, and Tromp in seventh through tenth, in that order. Ashe Cawley stands at the top of the Eastern Sub-League standings, followed by Mattias Tromp and Germany’s Wilhelm Genn, who declared with that sub-league and was victorious in Sacramento this weekend. The California World Cup qualifier was a career first for Genn. Ironically, he lives and trains quite close to the Columbus venue at his Rheinland Farm but found himself across the country competing in the Western Sub-League on Saturday. With his Dutch Warmblood Bugatti, Genn bested a field of nine other jumpers in a tight jump off at Sacramento, completing the course without a fault in 36.88 seconds and taking the $100,000 Longines FEI Jumping World Cup™ prize. Bugatti began his equine career as a hunter, but didn’t have what his riders needed in that discipline. Lucky for Bugatti, he wound up in Genn’s hands, after the German rider recognized his potential and asked his owner Eduardo Leon for a chance to try him on the jumps. Second place at Sacramento went to Karrie Rufer of the USA who turned in a clear round in the jump off at 37.31 seconds. American Karl Cook finished third in 38.47 seconds with no penalty points.